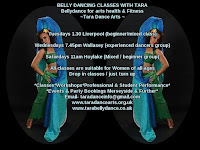 What Makes A Good Belly Dance Class? What makes a good belly dance class I hear you say? In most instances there are no good or bad classes. Put simply it all comes down to what you enjoy, Your learning style and what you want to get out of it. For example: I prefer a classes where I can learn whilst still being engaged and entertained with a friendly but professional teacher who facilities rather than indocrinates, Who inspires me rather than influences me, Who is encouraging understanding and supportive, Who gives honest advice and critique wether good bad or ugly and treats everyone the same and discourages abusive behaviour. In easy terms a teacher who is more of a host or leader who is part of the group, Not someone who extorts power over the group or exploits people. always trustworthy for instance Jimmy Savil had many people singing his praises and Jesus was crucified....I rest my case. It is easy to flock with the sheep but the best thing to do is experience a class for yourself to see if that class is for you. A good teacher will always encourage class participants to attend many classes with many teachers. Every teacher who facilitated the workshops and lessons I attended have have inspired and helped to hone my dance skills. I hope this blog post inspires you to try out a different class and workshops with different teachers just to compare and to see if other classes fit in with who you are and how you learn. You may be surprised. What ever you do and where ever you go in dance I wish you blessings, Good teachers and good times!